Time for some holiday baking. Abbey decided custard tarts were the go. 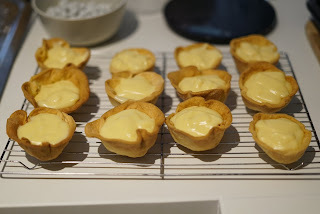 Rather than repeat the previous cooked-in-oven custard, she wanted to try filling tarts with Creme Patisserie. So, making sure we grabbed some extra eggs at the shop, we started the creation as soon as we got home, borrowing from a few places to make the recipe below (as remembered / dictated by Abbey). Chop butter into little cubes and chill. Blend flour and chilled butter until the texture is grainy like sand. Continue to blend until lumpy. Wrap dough in glad wrap and chill in refrigerator for at least 30 minutes. Prepare a 12 cupcake pan with strips of baking paper (large enough to pull the baked tart cases out). Roll the dough thin and cut circles large enough to fill the cupcake moulds. Combine leftovery bits if needed to make up 12 cases. It's hot here so we did this in two halves, putting the pan in the fridge in the middle. Chill the pan for about 20 minutes before baking. Stab the bottom of each tart case a couple of times with a fork. Cut out 12 squares of foil and place in the tart cases with baking beads in the foil. Cool for a few minutes before extracting onto a cooling rack. Measure and combine dry ingredients in a large heatproof bowl. Whisk in eggs until thoroughly combined. Boil milk and vanilla on a medium to high heat on the stove, stirring constantly. Once milk is boiling, pour into the egg stuff [ed: Abbey's word] and whisk until combined. Quickly pour back into the same pan and stir over medium heat until thickened. Pour into a cool pouring jug and fill the cases with the yummy yummy custard goop!